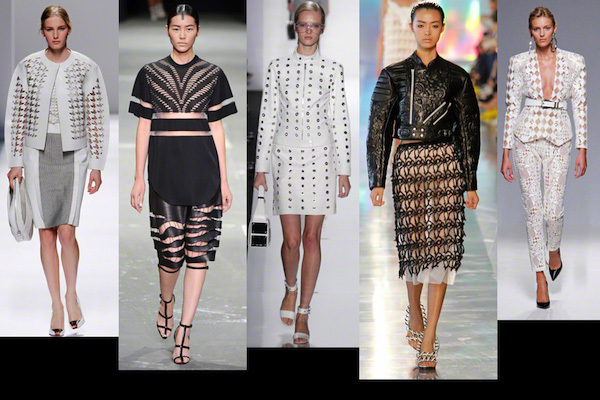 Spotting trends, common threads, strong statements and influences was not an easy task this S’2013 catwalk season. What does this tell us about the present status of fashion? Is this the outcome of the current economic turmoil? Making designers opt once more for carefulness, minimalism and restraint? Does this push immaculate tailoring and supreme crafts? Excitement more hidden in cut and materials then in expressive aesthetics? Reflecting on this we concluded that there was pure concentration on the making of beautiful clothes rather then strong fashion statements. We saw lines of models wandering like babbling brooks, very interesting but far from mind goggling. The strongest acts of expressionism where in the sphere of geometrics and linear patterning. An interesting pulse came from textile technology, novel finishing and techno-crafted embellishment. Outspoken silhouettes where most inspired by the Orient, which was a follow up from what started previous seasons, rather then being a novelty. Understated black and white reigned when it came to coloring. And the return of patterning was near to non-existent. So it will be the high street in desperate need of ways to differentiate, that will fuel the pattern trend, or it will take another season to reflect on it. And let’s be honest … in the context of recent catwalks, the few collection showing pattern, print and decorative accessorizing seemed quiet trivial and out of sink. The lessons learned where: ‘how to be beautiful’, rather then ‘how to be fashionable’. And what can be wrong with that? But… after seasons of flash backs and heritage, playing safe and conservatism… aren’t we in need of excitement and entertainment? Isn’t this what catwalk shows should be about? To be honest… we would have loved to see the sparkle of the unexpected. The fun is, it’s there! Just look at the street photography during the catwalk shows. There the fire of decorative expressionism and eccentricity is burning. It is all in the mix. Where Marc Jacobs and Moschino show a literary revival of the swinging 60s, Aquilano Rimondi, Costume National and Sportmax add a contemporary twist to manipulative and illusionist black and white geometrics. From neat linear stripes to optical cut, patched and scattered blocks. Alternating contrasts of matte and shine, as well as transparency and opaque. There is a massive interest in materials, in techno-crafted embellishment and innovative manufacturing. Sportmax lasercutted hounds tooth patterns where Alexander Wang cuts and carves in more organic ways. Michael Kors punches sail rings and rivets where, Christopher Kane shows spectacular updates of quilting and lace, where, Balmain goes over the top showing glamazones in leather embellished with a layering of techniques. Works of art or couture mathematics? Costume National shows graphic cuts and sharp asymmetrics, balancing layers and proportions. 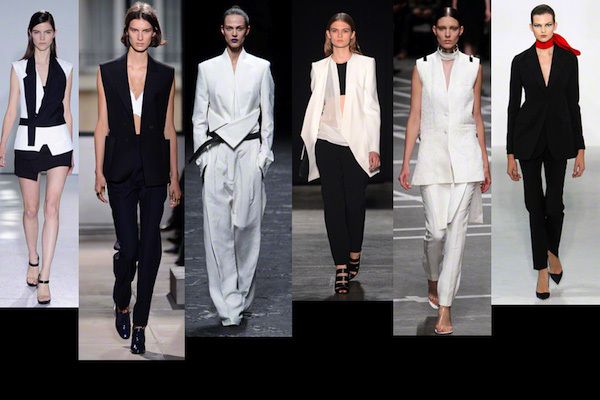 Balenciaga confirms the important role that the sleeveless jackets will play coming seasons, martial arts reflect in Haider Ackermann’s wrap suits, where Narciso Rodriguez goes classy, Givenchy throws layers and Dior goes for powerful contours.